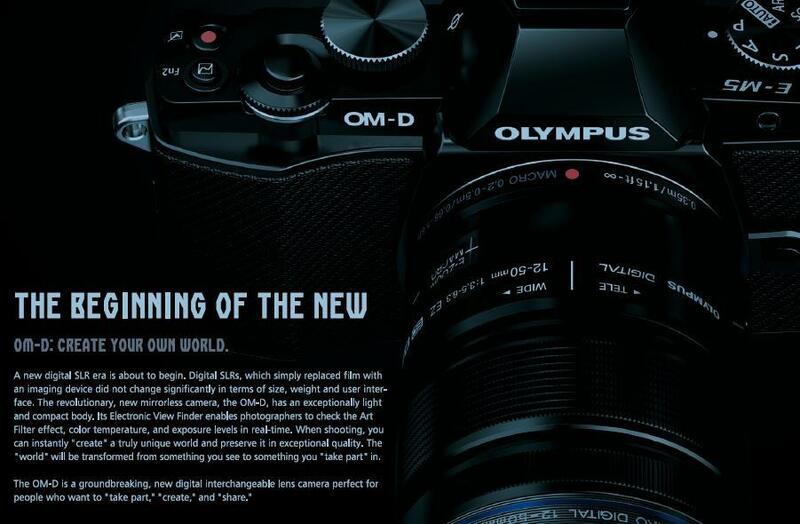 A seemingly genuine brochure picture of the forthcoming Olympus OM-D camera is circulating currently. Looks very nice. Interesting text which includes the phrase "A new digital SLR era is about to begin"
Is this how Olympus propose to deal with their 4/3 lens range? Certainly a camera styled like their film OM series would work very well with those lenses, and there is apparently a new adapter, which is weather sealed like the camera. It could give a new lease of life to a wonderful range of optics that really hasn't been done justice to date by the Olympus 4/3 range of cameras. Personally I think this is a much more exciting prospect than the overpriced and overhyped Fuji X-Pro 1 (£2000 for camera and one lens!!!!!) and the woeful Pentax K-O1. The original OM series was an excellent system and there were other small SLR film cameras like the Pentax MZ's that were similar, in being small and light, but not so small as to be difficult to use. I just hope the Olympus camera division doesn't disappear before this thing appears, as its a brilliant concept as far as I'm concerned. Its something many of us have wanted to see, and the idea of a semi-modular, well designed, reasonably sturdy CSC with the ability to take 1000's of lenses is very appealing. Whether or not Olympus survive their current financial mayhem obviously affects the prognosis, but if Olympus have got this right, and with their track record with the Pens there's no reason they shouldn't, they would be an attractive proposition for other companies should this part of the company get sold off. If the "brochure" image is correct then I think I'm in for a treat. Functionality, image quality and aesthetics. An absolutely irresistable combination.